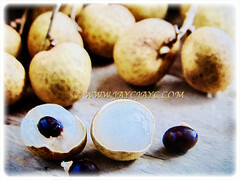 Longan or the Dragon’s Eye is a flavourful fruit that is savoured for its sweetness by many people. It is grown commercially and primarily for its edible fruit production in many regions of the world. Definitely, a very sweet, juicy and succulent fruit. 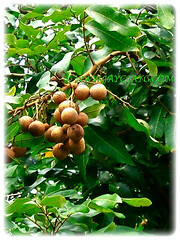 Botanical Name: Dimocarpus longan (syn. : Dimocarpus undulatus, Euphoria longan). 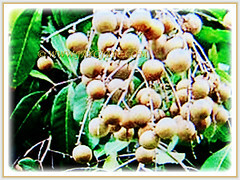 Common Names: Longan, Lungan, Dragon’s Eye, Mata Kuching in Malay. Etymology: The genus Dimocarpus is from the Greek dis, meaning twice and karpos, meaning fruit, probably referring to the two-lobed pistil. 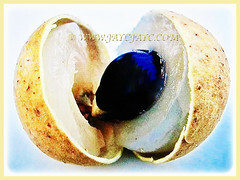 The species epithet longan is derived from the Mandarin long yan, literally meaning dragon’s eye, in reference to the resemblance of its fruits to the eyeball of the dragon’s eyes. Origin: Native to Temperate Asia including China and Taiwan and Tropical Asia including Sri Lanka, Indo-china, Malaysia, Indonesia and Philippines. It is also cultivated worldwide. Plant type: A tropical perennial tree with edible fruits. 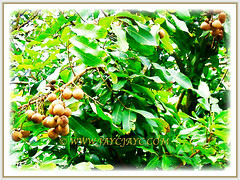 Features: Dimocarpus longan is from the genus Dimocarpus that consists of 20 species of trees or shrubs. A fairly fast-growing tree that can reach 30-40 m tall but it typically stands 9–12 m in height. The tree is a symmetrical and evergreen tree with dense dark green foliage. The woody trunk is 0.8 m in diameter with a corky bark and sometimes buttressed. Branches terete with five faint grooves, sometimes with warty pores known as lenticels and densely covered with rusty-brown soft hairs. The dark green, glossy and leathery leaves are pinnately compound and alternate. There are 6-9 pairs of leaflets per leaf. Each leaf is 10-20 cm long and 5 cm wide with wavy margins and blunt pointed tips. There are 6-9 pairs of leaflets per leaf. The inflorescence is terminal, 8-40 cm long, erect and densely covered with soft hairs and bearing small flowers that are pale yellow to yellow-brown and fragrant. Petals are densely woolly to glabrous. Flowers on the panicle are held on numerous cymules on the many branchlets of the panicle. The small flowers have 5 to 6 sepals and petals, and are brownish-yellow, with a two-lobed pistil and 8 stamens. The branches are long and thick, typically with fruits that hang in drooping clusters. The yellowish-brown drupaceous fruit is spherical to ovoid, 2–3 cm in diameter and weighs 6–19 g.
Each fruit contains a single shinny and globular blackish-brown seed that is covered by a thin translucent white fleshy layer. The pulp does not adhere to the seed and is flavorful and sweet. The fully ripened has a tan or light brown peel that is thin, leathery and firm, making the fruit easy to peel by squeezing the pulp out. The time from flowering to harvest is 140 to 190 days. 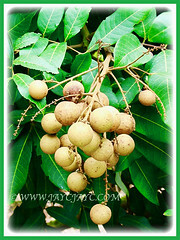 Culture (Care): Dimocarpus longan or Dragon Eye can be easily grown with least maintenance. Moisture: Moderate to high water requirements. However, it should not be over-watered. Soil: Fertile loamy and well-drained soils. However, it can thrive on various soil types provided they are well-drained. Others: Longan trees should be planted 7.6 m or more away from other trees and structures. Trees planted too close to other trees or structures may not grow normally or produce much fruit due to shading. Pruning is necessary to remove any remaining panicle and cutting out some of the subtending twigs to allow more light to the interior of the tree. Feed three times a year with a balanced or time-release fertiliser. You may want to bag the fruits in nettings to prevent the birds from attacking them. Generally free from serious pests and diseases. 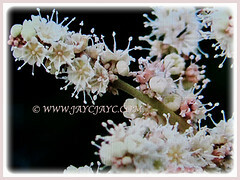 Several scale insects such as the lychee webworms and several scale insects, namely Coccus acutissimus, Ceroplastes spp. and Ceroplastes spp. to name a few as well as the longan stink bug (Tessaratoma javanica) can be a problem. Other insect pests found on longan include Erinose mite, fruit flies, aphids, stem borers, leaf/flower eating caterpillars, mealybugs, fruit spotting bug, elephant beetles and fruit piercing moth. Dimocarpus longan or Dragon Eye is somewhat sensitive to frost. They prefer cool and dry winters. Too much rainfall during that season encourages foliage growth rather than flowering. A distinct change of seasons is needed for satisfactory flowering to occur, with prolific blooming occurring with a short cool winter season. While the tree prefers temperatures that do not typically fall below 4.5°C, it can withstand brief temperature drops to about -2°C. Longans produce more reliably in areas characterized by low non-freezing temperatures 15°C or less and a dry period during fall and winter. Withhold or reduce watering during the late summer/early fall through winter is recommended to reduce excessive vegetative growth and enhance subsequent flowering during the spring. Feed with a fertiliser that includes phosphate and potash once quarterly. It is suitable for growing indoors and in pots. Propagation: Easily propagated from seeds. Alternatively, it can be propagated by air layering and grafting. 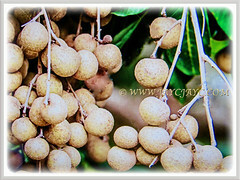 Usage: Dimocarpus longan or Dragon’s Eye with its ornamental foliage and drooping clusters of edible fruits will be excellent as a shade providing tree. It is ideal to be grown in the ground or in large tubs/containers. It is grown primarily and commercially for fruit production. It produces fruits that are sweet, juicy and succulent in superior agricultural varieties. 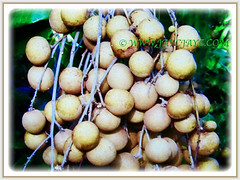 Apart from being eaten fresh, the dried and preserved longan fruits are often used in Asian soups and to make beverages including liquor. Its fresh fruits are also canned in its own juice with little or no sugar to prolong the lifespan of the fruits. The fruit of Dimocarpus longan is used as a traditional Chinese medicine for different treatments, such as promoting blood metabolism, soothing nerves, and relieving insomnia. The flesh and seeds of the Dragon’s Eye have medicinal uses while leaves and flowers are used by the Chinese as herbs.